True to earlier reports, Amazon’s Kindle Oasis is the smallest and lightest Kindle yet and comes with a handle for gripping. Amazon’s Jeff Bezos teased an “all-new, top of the line” Kindle last week and Chinese site Tmall.com sent the e-reader world in a tizzy when it accidentally unveiled details of Kindle’s newest addition to the family on Monday. The site quickly took the page down, but not before the tech press caught wind of it. 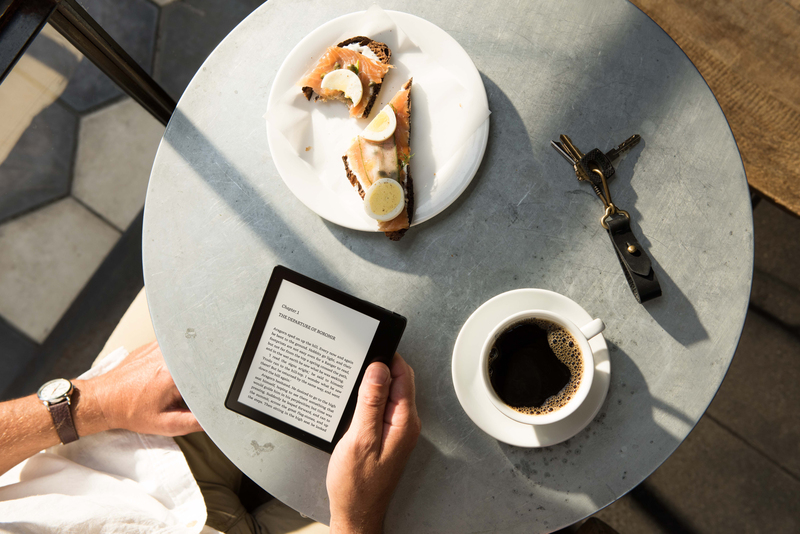 The latest Kindle steps ever closer to that real book feel with just 3.4 mm at its thinnest point and the new one-sided handle grip is designed to make you feel like you’re holding the spine of a book while reading. Left-handed bibliophiles might be concerned about a new back bump that seems designed for all the righties like in the picture above, but you can actually flip the Oasis and grip from either hand. There are also two buttons on the new device for flipping pages back and forth. It’s odd to include buttons after moving away from keyboards and buttons a few generations ago. But, according to Amazon, people just like buttons. So they are back. 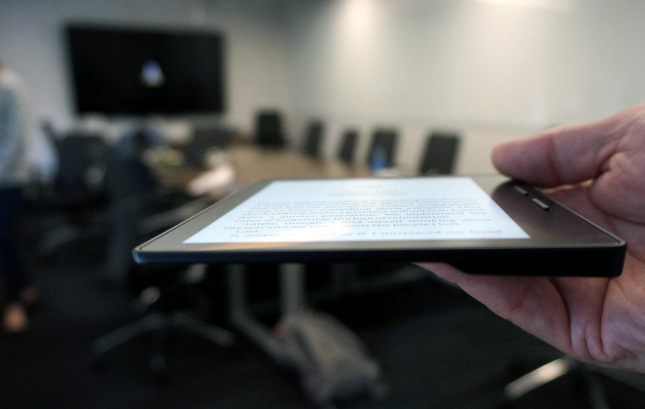 The Oasis is noticeably smaller than Voyage, weighing a total of 4.6 ounces, or roughly the same as a deck of cards – a manageable weight for taking along without adding too much to your load – and 20 percent lighter than any other Kindle. The thinner and lighter design still maintains a high-resolution 300 ppi Paperwhite display and comes with an even crisper and brighter front light for improved night reading. The lighting is also on the side instead of the bottom like with Voyage for a brighter and more evenly lit screen. Earlier rumors also mentioned a solar-powered case for the new Oasis. While that turned out to be a red herring, it does have a longer-lasting dual battery system. The smaller, built-in battery cell will last up to two weeks and the included charging cover adds a continuous charge of up to two months of life to the newest Kindle. Covers will come in walnut, merlot or black and can charge at the same time as you are charging your Kindle. Oasis will still display Amazon’s signature Bookerly (serif font) or Amazon Ember (sans serif) and will pull up your GoodReads list. The redesigned Kindle Store will also help newer Kindle readers find and define the types books they’d like to read in the future. We now know what the new Kindle looks like, but it’s not up for grabs just yet. Amazon tells me Oasis will be available for purchase “soon,” which most likely means the newest edition will be ready for delivery in a few weeks. Oasis will also be a tad pricier than earlier editions – Voyage goes for $199 retail. The WiFi version of Oasis will retail for $289 and the 3G version will sell for $359.